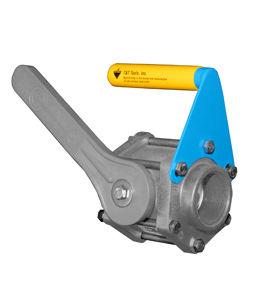 The vinyl-gripped Ball Valve Handle is designed to hold a ball valve steady. Made for 6-bolt 2" or 6-bolt 3" ball valves, the 5.5" long, 1" round handle can accommodate gloved hands. It connects directly to the ball valve unit for comfort and control, enabling the operator to grab, move, and position the pump hose with minimal effort.